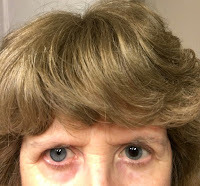 This morning I had the YAG laser capsulotomy performed on my left eye to remove the cells that were forming on the back of the new lens that was inserted following my cataract surgery in June. Essentially it was as if I was looking through a window that had finger prints on it. That is not exactly the result I was hoping for after bucking up for the expensive replacement lenses. My surgeon noticed the problem when I was in for my one month follow up appointment. In fact he said the right lens had some cells on it as well, but that the left eye was more prominent and the cells should be removed. My insurance company insisted that I wait 3 months post-surgery before they would approve the YAG procedure, which is why I didn't have it done before now. Fortunately for this I could drive myself to and from the appointment. I arrived at the surgical center about 8:50 for a 9:00 appointment. I signed the appropriate paperwork, and at 9:15 was taken in the back to have my eye dilated before returning to the waiting room. Shortly after 10:00 I was again taken back, this time for numbing drops, and then seated before Dr. Pepose in front of what looked like the normal machine they use to examine your eyes. He placed a clamp on my left eye to keep me from blinking, and as I kept my chin and forehead pressed against the machine, he zapped my eye with the laser. In less than five minutes it was all done. The assistant rinsed my eye, and then placed Lotemax drops in my eye. Lotemax is an anti-inflamatory steroid drug, and one of the three drops I had to use in both eyes following cataract surgery. For this, I need to place one drop in the affected eye three times a day for a week. I asked Dr. Pepose if I could go ahead and schedule the right eye since my deductible and maximum out of pocket expenses have been satisfied for the year, which for us ends on September 30th. He said absolutely, so I will get it done next week. I also told him about the fact that my left eye has a bit of discomfort still. I asked him if he ever wore the hard contact lenses. I got my first pair of those before my sophomore year in high school, and they were extremely painful to get used to. You had to build up a callus on the back of your eyelid, and that is sort of how this feels. He suggested I try taking fish oil pills twice a day, as that has proven to help some patients with dry eyes. Otherwise the option is for me to use prescription eye drops like Restasis. I'd like to avoid that if possible, so I'll give the fish oil a go and pray for the best. My left eye has seemed a little better the past few days, so perhaps I am turning the corner on that problem anyway. Of course, having the laser treatment done may change all that. In all, I was at the office an hour and twenty minutes. They had warned me to be prepared to be there two hours, so getting out early was a bonus. Hopefully next Wednesday will go just as smooth.